Grand is a 6-story, modern concrete building located in the tech hub of Vancouver. Only half a block away from both Broadway and Main, fine cuisine, designer shops, and the city’s best breweries are just steps away. Even with open floor plans and breathtaking mountain views, privacy is recognized in Grand’s 100% concrete structure. Bridging the gap between luxury and practicality, Grand has impeccable style from lobby to unit, along with many technologically advanced amenities. From $829,000. Sales start in May 2019. Sign up to our VIP list above for priority access to Grand updates. Choose from just four 1-bedroom or 14 2-bedroom homes, ranging in size from 513 to 1,313 sq ft. Serious buyers are advised to contact me today to discuss your needs. This exceptional boutique offering is expected to attract strong interest. All residential suites have 9′ ceilings and 10′ ceilings grace the penthouse level. Folding accordion balcony doors custom-designed in Vancouver create a seamless transition to your balcony. Grand features Record e Cuccine cabinets imported from Italy. Kitchens are not visible from the suite entry. 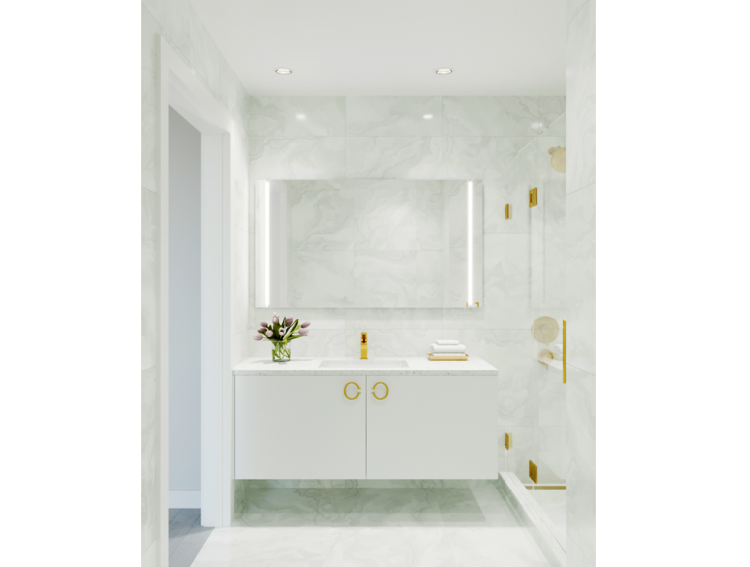 Cerasa imported bathrooms boast floor-to-ceiling marble and copper fixtures. Each home has built-in air conditioning, a washer/dryer, and a Smart Tek Smart Home system. In the lobby is a Lockourier Luxer One package hub so you never miss your delivery. Residents will also enjoy the shared use of a ground floor amenity space that includes a kitchen and accessible bathroom. An adjoining outdoor patio will feature a hot tub, barbecue, and seating area. A gym is located on the second floor with a Fitness on Demand virtual training program. A two-level parkade accessed by car elevator will provide 23 vehicle parking spaces, including 2 accessible stalls, and 1 commercial tenant stall. Ground floor storage will accommodate 23 bicycles and short-term racks at the lobby entrance, another 6. Storage units are free for the first seven home purchasers. Additional units can be bought for $6,000 each. 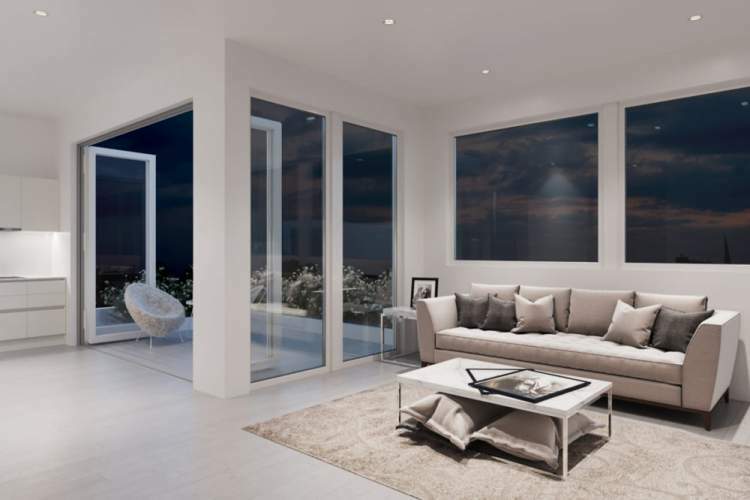 Green Oak Development is where Italian high-end fashion meets real estate. 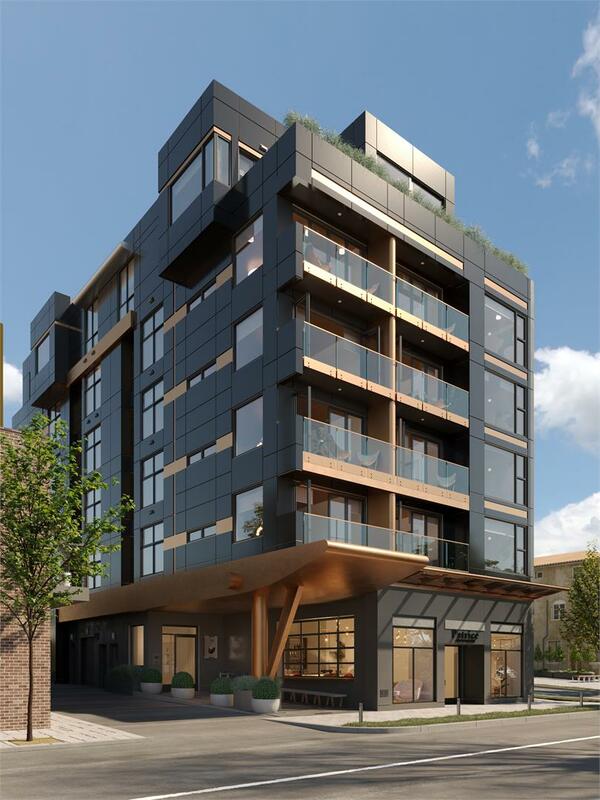 Distinguished by its European attitude, based on style and contemporary aesthetics, Green Oak is changing Vancouver’s panorama. Specializing in opulent estates, mixed-use complexes, and multi-family residences, Green Oak breathes life into every project by treating each space like their own; paying delicate attention to the intricacies that turn a house into a home. 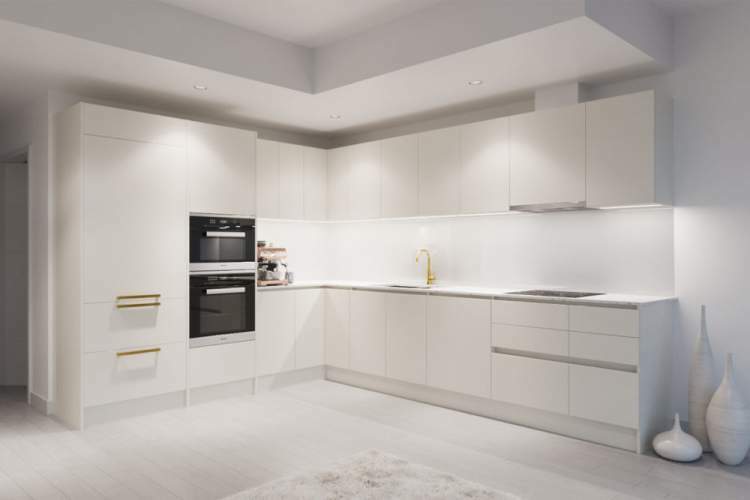 To give its clients the superior quality they are looking for, the company is importing top-level kitchens, living rooms, bathrooms, tiles, and many other furnishing and construction materials directly from Italy. Since 1994, False Creek Design Group has provided comprehensive design services on projects in all categories and of all sizes, from custom residential to large corporate projects; from retail locations to not-for-profit community organizations. FCDG’s approach is based on an integrated design process, working collaboratively with all stakeholders in the design and construction process. Engaging and promoting participation minimizes compromise and maximizes outcomes on all levels and through all stages of a project. FCDG has long been a proponent of sustainable design and their work continues to be based on principles of social, fiscal, and environmental responsibility.